One of 10 installation views from the November 2012 exhibition at Konsthuset Uppsala Konsthall. 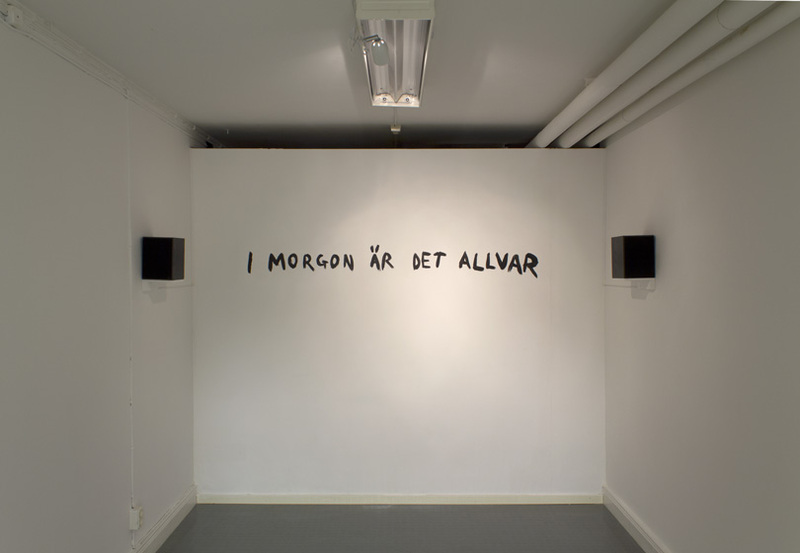 Here: a wall painting "I morgon är det allvar" (Tomorrow it will be serious). On each side of the sentence a loudspeaker. A selection of music was played, randomly programmed, with long intervals: five "re-constructed" songs by JS' 1980-81 group "Svart" along with three excerpts from the music played by Hans Pålsson in the video "Concert" and JS' 2010 composition "Jacques Vaché in Marl".